80th Birthday Last Ever Edition 'Dork Kroo' - Pra Ajarn Nong's World Famous Kong Grapan Chadtri amulet, the Takrut Narai Plaeng Roop, released in 2542 BE with Code Na, and Code Dork Jantr Nor stamps. 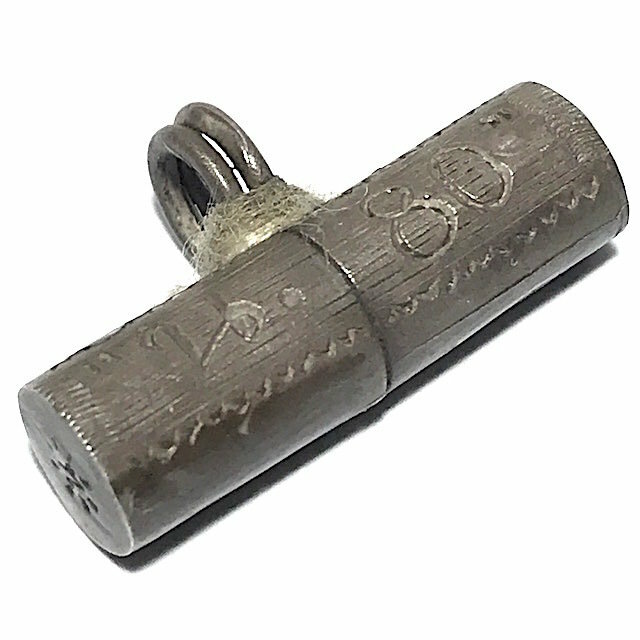 This special Dork Kroo Version, is engraved with decorative filigrain pattern on outer shell, and is a Master Class Amulet of Great Rarity, and famed for its authentic power of Kong Grapan Chadtri and Klaew Klaad. This was the last ever edition blessed by Pra Ajarn Nong before he passed away a few months later in the very same year. The Takrut Narai Plaeng Roop in all its various editions is considered a Master Class Amulet of Extreme rarity, and famed for its authentic power of Kong Grapan Chadtri and Klaew Klaad. This Takrut of 80th Birthday Edition bears the preferred code stamp 'Na' Khom Agkhara embossed, with code stamp 'Nor' and 'Dork Jantr' aura stamp. The Takrut shell is made with decorative engravings. The Takrut Narai Plaeng Roop i the most famous of all Takrut by Ajarn Nong. It is also known as the Takrut Look Pern Narai Plaeng Roop, which was so successful with Devotees, that it became his trademark. Especially in the Vietnam War, the Soldiers who had received Takruts from Ajarn Nong all came home safely without one single exception, and many returned with tales of miraculous escapes from death, attributed to the magic of Ajarn Nong's Takrut amulets. 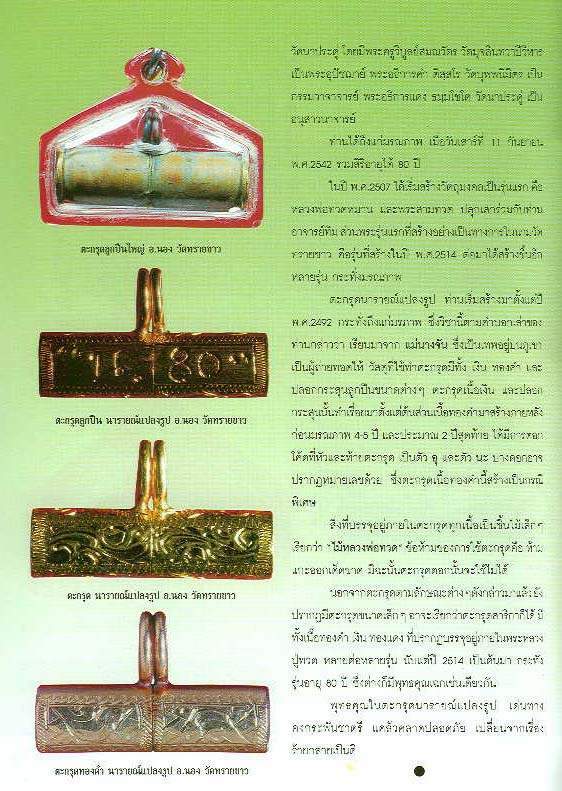 The Takrut Narai Plaeng Roop was made both with real bullet shells, and also in a decorative case version made in bullet shell shape, which were made once all bullet shells were depleted, but devotees still called for more Takrut. Both versions ended up becoming equally popular. There are so many tales of Devotees encountering Miracles and life saving magic, that the legend of his Takrut follow him like his own shadow. It is said that Ajarn Nong began to make and hand out Takrut Tone amulets around 2496 BE, which he would hand out to his close disciples. The very first Takrut were made from small sheet of Iron, and were small in size. Some time later, some Looksit brought some gun shells to use for Takrut making. These Takrut were varied sizes depending on what kind of bullet shells were available. This edition gained much fame and legendary status for the many life saving tales from those who possessed one. Ajarn Nong's Takrut are famous also for their Puttakun power to change bad luck back into good luck, and to transform fate. After he began to make bullet shell Takruts, his magic also became known for powerful ‘Maha Ud’ (Gun Stopper) and ‘Klaew Klaad’ (Evasion of Danger). Whenever LP Nong would hand out one of these Takrut, he would say ” this is for protection, if someone thinks to harm you, you, they will not be able to find you, and those who try to harm you, will encounter their own demise. The letter stamped on the end of each individual Takrut varies greatly through the whole alphabet, depending on the source, for indeed, many different sources (devotees) donated a constant flow of bullet shells and metallic tubes for the production of this series. The Wicha Narai Plaeng Roop used for Ajarn Nongs Takruts is an Ancient Wicha, which is mentioned in the Dtamra Saiyasart as being a Wicha which has immense power, like that of Pra Narai transforming. It contains a multitude of different blessings. The Wicha of making a Takrut with the image of Pra Narai is a Wicha which not many people know how to perform, which makes this type of Takrut extremely rare to find. To perform the spell properly, it is necessary to Master the ‘Wicha Dtang Agarn 32′ and the ‘Wicha Riak Roop Riak Nam’, as is usual with all spells that use the image of a being, Himapant animal or Deity. But it is much more difficult to force and contain a magical image of Pra Narai using incantation, than it is to contain and subdue a lower Deity or Himapant animal. This is therefore the reason why there are hardly any Masters at all who can enforce this type of magic spell. 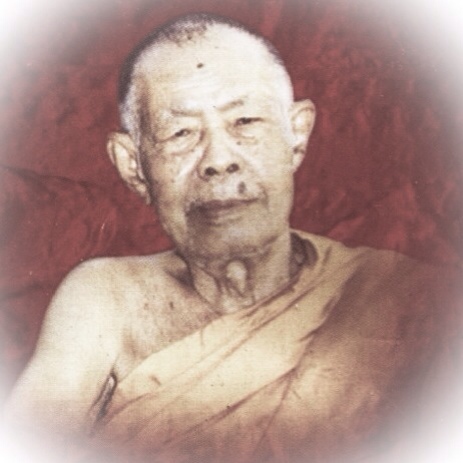 There is a story recorded in the Biography of Somdej Pra Puttajarn (Dto) Prohmrangsri (Wat Rakang Kositaram) written by Maha Amamat Praya Tip Gosaa (Ajarn Sorn Lohanant) and Pra Kroo Plad Maha Thaeranuwatra (Maha Pae). The Biography was published to celebrate 200 years of the Ratanakosin Era. In the story it tells that, as King Rama 4 called upon Somdej Dto to accept a dignified status, Somdej Dto fled to the forest, and hid from the responsibility. He did not wish to have status, rather wished to be a simple monk. His Majesty sent envoys out around the country to find Somdej Dto, but however hard they searched, he could not be found. Ajarn Nong Thus believed everything that had occurred during his Nimitta Vision, including the fact that this Wicha for Takrut is authentic.The versions of Takrut Narai Plaeng Roop which were made with bullet shells, were ususally also filled with sacred items. The main sacred item Ajarn Nong would insert into the Takrut, is a kind of wood called ‘Mai Luang Por Thuad’, which the Deva Mae Nang Jantr told Ajarn Nong how to find, and take from Mount Kalakiree. No one really knows what kind of wood it is, nor what it looks like, because Ajarn Nong would lay out a rule that it is forbidden to break the seal of a bullet Takrut and open it. If such a thing were to happen, the Takrut would be immediately ineffective and never again usable. Offerings to Vishnu, and Vishnu Riding on Garuda Deity, should include the following Gratong (a kind of crown ornamental offering made from banana leaf), with puffed rice and spicy foods (2 or 3 kinds), sweetmeats and puddings (5 kinds), 3 kinds of fruits (banana, coconut and sugar cane is traditional), milk, butter (ghee), Kaprao leaf (Thai holy basil, known as Tolasee in India), white and green seeds, red beans in coconut milk, perfumed offerings, 7 small green flags (pennant), 3 pieces of cloth (green red and yellow), a clay doll (stone, cement or carved wood), and some figurines of cows, horses, elephants and buffalows. Incense, candles and flowers are of course indispensible. In addition, you could add water to drink in a glass, and perfumed pure water inside a conch shell for bathing. Chant the Kata then blow it into the offerings or into the amulet if raising over your head to wear for the day. In that case, raise the amulet between the palms of your hands in praying posture at your forehead and chant 3 times if making Bucha offerings and blow into the offerings. After the first time you perform the ‘Piti Buang Suang’ (offerings To Narai – place the amulet on the altar in the house), you must only chant once per day when putting the amulet on – chant the Kata, then blow your breath into the amulet. Do this once a day for however many years you have been living, plus one day extra. this will increase your lifespan and healthy lifetime, and in addition will make the power of Pra Narai make even more powerful blessings come to you.